If it were that izi. We have one of those types in our office, and he doesn’t even have a blog. Things like that just keep me in stitches which, in turn, keeps my resume fully updated. Stop giving away the secret, everyone will know why I started blogging! Eric must have been inspired by George. Your blog, especially your how-to-be-creative page, was one of the reasons why I started blogging last year. And it seems our little experiment with S60 blogs (S60 = software platform in Nokia smartphones) is becoming increasingly succesful. What cartoon did you send the CEO? Interesting. 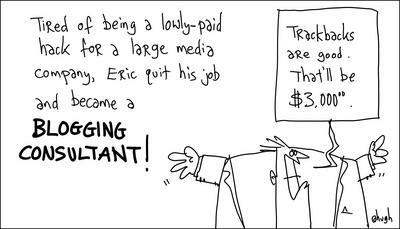 having turned a recent consultant (blogging is one of my service area) that cartoon was spot on ! 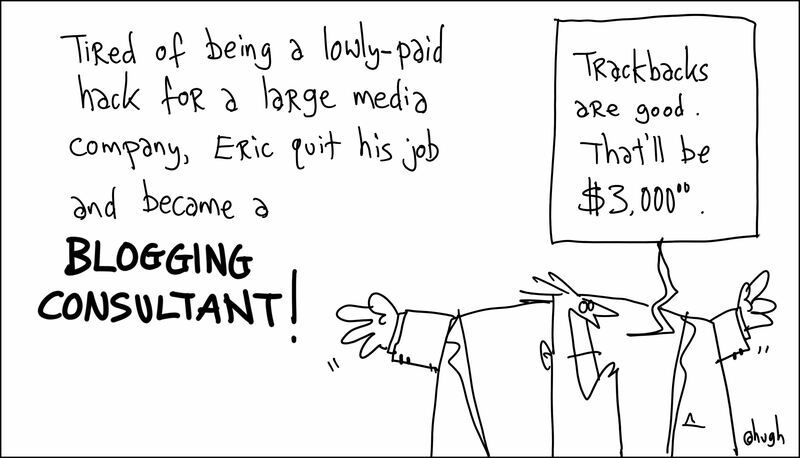 That is a good question: how to price, and how do you gauge when you’re ready to become a consultant…? Now, I truly want to be one of those. For $3000 (even CAD) I’ll do the job.